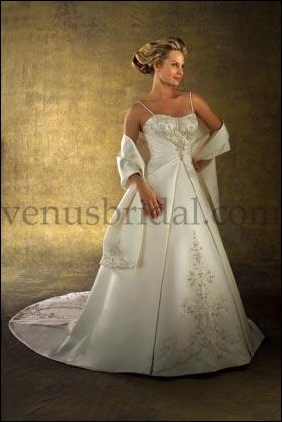 How can you choose a wedding dress for apple shape body type? Well it all starts with knowing how to play up the positives and hiding the negative. Let's identify your figure challenges. An apple shaped body type has very little waist definition. In fact, sometimes the waist is the widest part of the body. Most women with this shape have a full bust and a wide back, waist and hips with slender legs.. But some have narrow shoulders, small bust, wide waist with a protruding tummy and narrow hips. So your mission is to divert attention away from the mid-section and have the attention brought up to your face or focus on your legs. "To smooth out curves and add shaping you may want to consider wearing shapewear. One type that some brides have found very effective is to wear a waist cincher." The Venus Bridals dress style 7944f above does a good job camouflaging the mid-section. The split section overskirt that converge into a V point is a very slenderizing detail. This style slims the waist and gives a flat appearance to the stomach. The empire waist wedding dress above is by Venus Bridals style 2130f. The empire waist or raised waist style focus the attention above the waist. The soft fabric gathered to fall gracefully over the midsection flatters the apple shaped figure type. 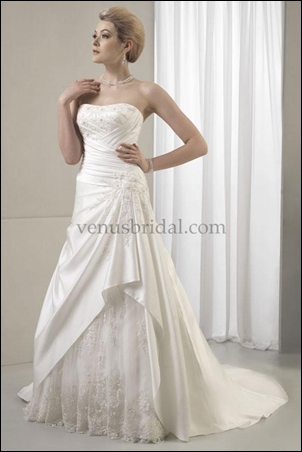 The Venus Bridals design 8056f above really has hiding power. Notice the asymmetrical pleating in the overdress layer which slims the waistline. Plus the draping in the front becomes an eye catching detail that diverts attention away from your midsection. If your legs are the part of your body you want to highlight... then you want to consider a short bridal dress. This one above has a strap that focus attention up to the face. The full skirt is out of soft fabric and hides the stomach area. The hemline which is the high low look focuses attention on your legs. This short wedding dress has a V- neckline an empire waist, a full flowing skirt in soft fabric and the short length focuses on your legs. All the details together make this a figure flattering choice for anyone who is apple shaped. If you look for gowns with the above details and style lines... you will find the perfect wedding dress to compliment your figure.